If there was one place on earth that I never expected to visit in a lifetime of travels, it was the continent of Antarctica. To those of us who learned geography from the big world map that was displayed in flat Mercater projection at the front of every elementary classroom, Antarctica was scarcely a land at all – just an irregularity spread across the bottom of the world, a world that the school map cut off at about 65 degrees south latitude, there not being any countries or capitals to memorize beyond that point. Even as I grew up and attended Carleton, where the college president was the distinguished Antarctic explorer Laurence M. Gould, I thought of the Antarctic as an unattainable place - scientifically interesting, but remote and dangerous – something like the moon. It was too inaccessible, too far removed from human history, and most of all, too cold. Yet on New Years Day 2005 I returned home from an adventure in Antarctica, having made the discovery that I was wrong on all three counts. Antarctica might be far away, but in summer at least, it can hardly be described as inaccessible, visited as it is by thousands of tourists on cruise ships as well as by scientists and military personnel. 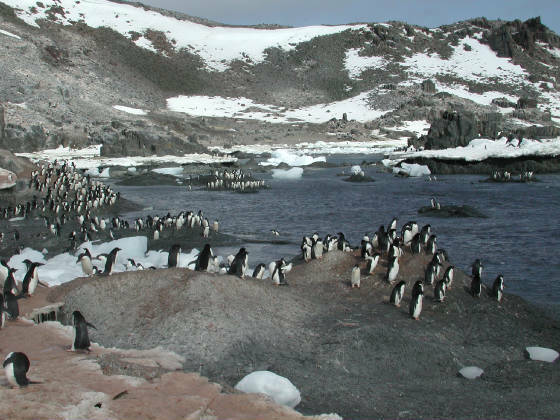 As for history, it might be outside the traditional classroom curriculum, but it is most certainly a focus of international interest, with 44 countries participating in the Antarctic Treaty, 27 of which have research stations or research projects on the continent and its surrounding islands. It is also the setting for epic tales - the stories of Robert F. Scott, Sir Ernest Shackleton, and other explorers - that rival the heroic age of any nation yet are much closer to us in time, taking place a mere century ago. Finally, I learned that a December day on the Antarctic Peninsula is not much colder than the temperatures I left behind in Central Texas, where a “blue norther” had thermometers hovering around the freezing point. By the time I returned to Austin, I had succumbed to a bad case of the Antarctic disease – an incurable obsession with the White Continent.